Dan Pinck served in the OSS behind enemy lines in China. His memoir, Journey to Peking: A Secret Agent in Wartime China (Naval Institute Press) was nominated as a book of the year by the Independent Publishers Association in 2004. Yale Professor Robin Winks, author of Cloak and Gown, wrote that "Dan Pinck has written one of the best autobiographies on the life of the secret agent in the field that I have ever read: lively, amusing, true, and well-written." 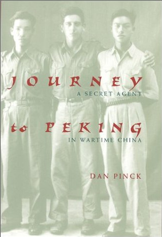 Noted OSS historian Joseph Persico wrote that "having written three books dealing with the OSS, I can say that nothing I've read captures the dash, the mystery, and the improbability of that citizen spy service than Dan Pinck's vivid account of his adventures in wartime China. Pinck tells his tale with a survivalist sense of humor, recognizing that war is hell but not without its amusing absurdities. Here is truth told with the punch of a well-crafted novel." President Kennedy aide, historian, and OSS veteran Arthur Schlesinger said that "this spirited and irreverent memoir of life as an OSS agent in China is both excellent reading and a useful footnote to history. W.E.B. Griffin: "What most war memoirs do is capture big events. What Dan Pinck - who has done it all - does is relate the day-in, day-out experience of being in a covert war." Many of Dan Pinck’s articles, essays, profiles and reviews have appeared in such leading magazines and newspapers as Financial Times, The New Republic, Preservation, Foreign Intelligence Literary Scene, The Intelligencer, The Reporter, The Saturday Review, The Boston Globe and The New York Times. Pinck was a longtime contributor to Encounter and The American Scholar. In the late 1940s he worked as a legman for A. J. Liebling at The New Yorker. Dan Pinck and his son, Charles Pinck, jointly had an Op-Ed on intelligence published in The New York Times. Dan Pinck lives in Cambridge, Massachusetts, where he serves as the head of the New England Chapter of the OSS Society. He is working on a new and expanded edition of Stalking the Office of Strategic Services: An OSS Bibliography. Dan Pinck is presently editing a play he wrote about Tom Stoppard. He attended Sidwell Friends School in Washington, D. C. and Washington and Lee University. He has worked in administration at the Massachusetts Institute of Technology and in research at Harvard. He has consulted in ten nations in sub-Sahara Africa; in the sub-Continent; and has traveled extensively in China.